Further Comments: A certain part of the road is said to be covered in skid marks where various cars have had to brake to avoid hitting a phantom woman dressed in a white coat. The figure always vanishes immediately afterwards. Further Comments: A photograph taken by artist Malcolm Baker appears to show the upper body of a white figure moving through foliage just outside the castle. Baker believes the figure to be a nurse in 1950s uniform, carrying a tray in front of her. A few months later musician Dan Smith reported spotting a nun dressed in white on the beach just after dawn, the figure quickly vanishing. Further Comments: A lady in white is said to drift along this stretch of road. Further Comments: Differing stories for the same myth - the first states that the White Lady was the wife of a former owner, murdered by her husband. She floats around the moat, the place she was drowned. The second tale places the murder in the hall, this time by persons unknown. The body was then thrown into the moat from the battlements. Further Comments: A young lady dressed completely in white is said to haunt this building. The ghost was seen as it descended the main staircase. Phantom music has also been reported in the house. Further Comments: The main road leading through Calverton is said to be haunted by two ghosts - a man wearing a tweed suit and sporting a ginger beard walks along the path, while a phantom white lady waits patiently at a bus stop. 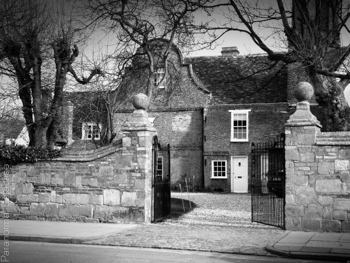 Further Comments: Exorcised at the turn of the last century, Abbey House was said to be the former home for a poltergeist, the echoes of chains, a butler, a woman in white, a squirrel, and a hare. However, the sightings of a grey lady in the 60's may prove reports of the success of the exorcism premature. Further Comments: No recent sightings of these figures have been reported, and locals accept them as being little more than smuggler's stories told to inspire fear. The white lady is said to offer to dance with anyone she came upon during her walks, while the black man offered to buy souls in return for a song. The White Lady was seen around 1917 by a group of men out partying - one of them chased after the figure with a large stick, but the apparition disappeared before he reached it. Further Comments: A 'new' building on the site of thirteenth century ruins, the White Lady once haunted the older area, and now has set up shop in the replacement castle. The woman is said to have died of a broken heart after her son drowned in a local pond. There is also reported to be a buried hoard of treasure here, zealously protected by either three eagles or an entity who confuses any potential gold thieves, while an ethereal cavalier walks the castle grounds. Further Comments: This phantom lady was once challenged by a soldier on guard duty - she faded in front of him, and he died of shock several hours later. It is believed the ghost may have belonged to a body found in 1835, bricked up in a castle wall. Further Comments: In a reversal of the normal tale associated with these stones, if a witness spotted the Devil nearby, she or he had to run around the stone to dismiss Old Nick. The stone was also said to be haunted by a woman in white who was once sacrificed on it. Further Comments: A glowing woman dressed in white was observed by four people here. The radiant figure walked towards them before turning towards the sea and vanishing. A local legend says the woman had been spurned by her lover and walked into the sea (which before then was further inland) to drown herself. Further Comments: The white lady who haunted this building was said to have been murdered and disposed of down a well that is now located under the dining room. The lodge is also haunted by a monk in a brown habit, who may be the cause of the disembodied footsteps occasionally heard travelling around the building. Further Comments: A driver and her passenger both watched a woman in white sweep across the road as they drove towards Bridport. They both reported that the car suddenly became cold at the time of the sighting. Further Comments: A radiant white female form has been seen a couple of times in the lake within the Hall grounds - it is believed to be a woman who drowned herself after falling in love with a monk. His ghost in turn may haunt the hall. Further Comments: Having died in childbirth, Madam Pigott was seen dozens of times carrying her baby and combing its hair. Some also reported the lady also having a cat with her. She was eventually exorcised by twelve parsons, though in 1969 two motorists separately reported a white figure on the road near the church. Further Comments: Said to resemble Stan Laurel, this ghost was seen in Friday Hill House by a former occupier. A crying woman in a white veil has also been seen on the site. Further Comments: Hanged during the Civil War by a traitorous priest, this female member of the Mundesley family still returns home. The beam of wood from which her body dangled is considered lucky if you touch it. Further Comments: This figure was seen running up the staircase of the building - when the landlord gave chase, the man vanished into thin air. A white woman has also been seen on site, and at one time a group of bar dwellers watched as a pint of beer was pulled by a phantom hand!